Although the equations for fluid motion are hundreds of years old, and despite a strong and continuous interest of the scientific community in their study, much remains to be understood. This is not saying that no progress has been made! 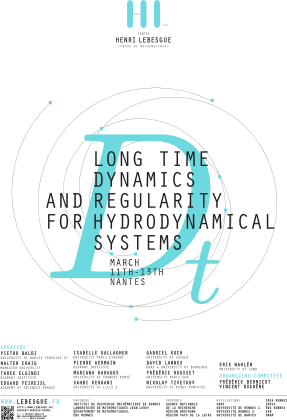 On the contrary, the study of hydrodynamical systems is a good example of a field where the development of new mathematical tools have accompanied (and sometimes have been developped for) a deeper comprehension of the multiple and complex phenomena hiding behind these seemingly simple sets of equations. The Registration webpage will be open until February 15. A precise schedule will be updated as soon as possible, at the moment the scientific program is planned to begin on March 11 at 11h00 a.m.